Riley is now a toddler that loves being on the move. 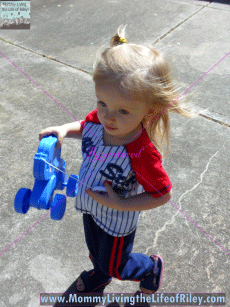 Any toy that she can toodle along on is number one in her book these days. Now, there's a very classic and inexpensive toy on the market called the New Beginnings Ride On Toy, which is sure to delight any young child. 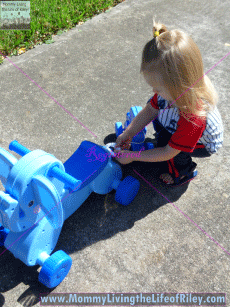 Riley and I had the opportunity to review the Trunk and Lil' Trunk design of this toy. 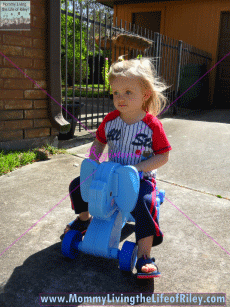 Keep reading to find out whether or not Riley liked her two new elephant friends! I reviewed the New Beginnings Ride On Toy - Trunk and Lil' Squirt from Moose Mountain Toymakers, which retails for $24.99. I was very pleased the instant that the New Beginnings Ride On Toy arrived at our door. 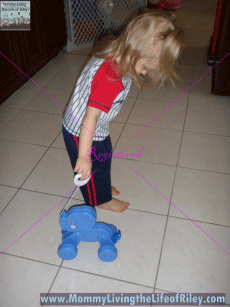 This toy was extremely durable and sturdy and required absolutely NO assembly. It was ready to go right out of the box...which was a good thing, since the minute that Riley saw it, she was dying to get on and ride! The Trunk and Lil' Squirt Ride On Toy from New Beginnings is a well-made toy with a "mama" and a "baby" elephant. 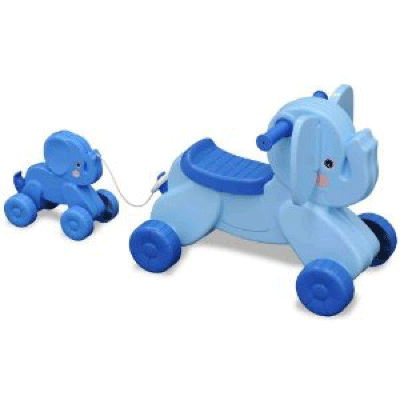 What's cute is that the baby elephant can be used individually, like a classic pull-toy, and can also be hooked to the tail of the mama and pulled around while riding the larger toy. Riley thought that this was extremely amusing and kept wanting to pull around the baby and hitch and unhitch it to the mama toy. 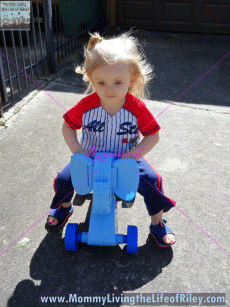 Once she got on the mama toy though, she was a regular little traveler. She rode and rode the Trunk and Lil' Squirt toy all around outside and even insisted that it be brought inside so that she could ride it in the kitchen too. 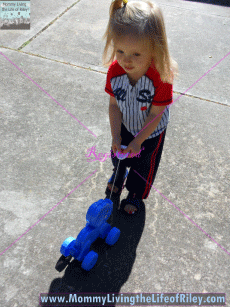 This toy is a wonderfully designed toy and one that has really captured Riley's imagination. She can constantly be found scooting around on the New Beginnings Ride On Toy, for it is one of her favorites. If you are looking for a classic, quality toy which won't break the bank this Christmas, then I highly recommend shopping for one of the three styles of New Beginnings Ride On Toy. Any small child will find hours and hours of delight by both riding on the large toy and using the smaller one as a pull toy. It's also perfect for use both indoors and out! Disclosure: I received the New Beginnings Ride On Toy - Trunk and Lil' Squirt from Moose Mountain Toymakers in order to facilitate my review. No other compensation was received. This product review is based on my own personal experiences with this item and is completely honest and objective.